Take US RT 40 west through Woodstown. Proceed 1-1/2 mile from Woodstown to traffic light in village of Sharptown. (See Richman's Restaurant on right). Turn left at light and travel 3/4 mile to our entrance on right. Cross Delaware Memorial Bridge into New Jersey. Just before turnpike toll plaza, take exit for Rt. 40 East - Atlantic City. Proceed on Rt. 40 eastward 6-1/2 miles to traffic light. (See Richman's Restaurant on left). Turn right at light and travel 3/4 mile to our entrance on right. Take Rt. 295 south to Exit 4 (sign reads "PennsGrove-Woodstown"). Exit, turn left at top of ramp, and proceed east on Rt. 48 toward Woodstown. (Disregard sign for Game Creek Rd.) After 2-3/4 miles, Rt. 48 will merge into Rt. 40 east. Proceed 3 miles to traffic light in Sharptown. (See Richman's Restaurant on left). Turn right at light and travel 3/4 mile to our entrance on right. 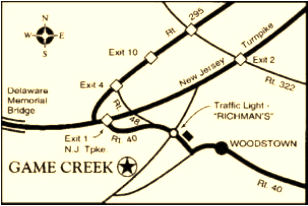 Take Turnpike south to Exit 1 (termination point). Pass through toll plaza and take first exit. (Sign reads ("Penns Grove-Deepwater"). Exit road comes out to traffic light. Make a hard left. Proceed 1/4 mile to another traffic light. Turn left onto Rt. 40 East. Travel Rt. 40 East 6-1/2 miles to first traffic light. (See Richman's Restaurant on left. Turn right at light and travel 3/4 mile to our entrance on right.